In honor of National Grilled Cheese Month, we're getting down with grilled cheese. And we're not talking about the classic grilled cheese (although it's one of my favorites, I promise.) 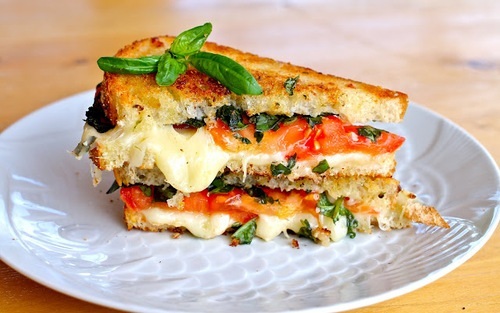 We're talking fancy grilled cheese sandwiches that you can make in under 10 minutes. In one pan or skillet, prepare the grilled cheese sandwich: butter two slices of bread, stick a slice or two of cheddar cheese in between, and stick on the skillet. In a different pan, crack open an egg and cook it sunny side up until it's as well done as you like it. Lift up one slice of your sandwich -- the cheese should be gooey by now -- and slip the egg in with a spatula. Again, in one pan or skillet, prepare the grilled cheese sandwich: butter two slices of bread, stick a slice or two of pepperjack cheese in between, and stick on the skillet. In another pan, add two tablespoons of vegetable oil, place in four to five stalks of asparagus cut in half, sprinkle with desired amount of garlic salt, and cook on medium heat for four or five minutes. Lift up one slice of your sandwich and slip the asparagus into the melted cheese. Prepare the grilled cheese sandwich: butter two slices of bread, stick a slice or two of swiss cheese in between, and stick on the skillet. In another pan, stick a few slices of bacon in and fry until done. Lift up one slice of your sandwich and place the bacon in the melted cheese.